Morry Hyams: Where are you going? Sadie Hyams: To get some fresh air. Don't worry, I'll get it wholesale. 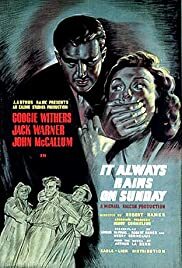 A rather splendid 1947 b/w film from the Ealing Studios. I find a lot of these films a little too sentimental and the acting a bit too stagey but this is a real surprise. Great dialogue, convincingly conveyed and together with super cinematography combine to make this a truly enjoyable if nostalgic view. The locations are more Camden than the East End, except for glimpses of Whitechapel at the start but no matter, it all looks good and the views of the railway marshalling yard at the end quite stunning. There is a central story but is is intercut with others and the whole thing bounces along nicely. Even the kids are all right and the amusing bits still amusing. Really though this is a very believable view of London's East End just after the war. Bomb sites, rationing and everyone trying to make the most of what they had. Also there was a feeling that the cops and robbers weren't really that different from each other, just on different sides and the important thing was to survive. Well worth a watch.